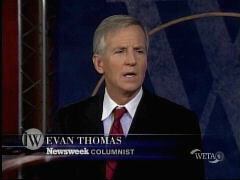 Newsweek’s Evan Thomas and Jon Meacham shared a bizarre Obama love-fest session with Charlie Rose on the PBS host’s program on Wednesday. Meacham stated that he was "very struck watching the stagecraft" of Obama and pointed out how Obama gave his victory speech by himself: "...[H]ave you ever seen a victory speech where there was no one else on stage? No adoring wife, no cute kid -- he is the message." Thomas went one step further in this vein: "There is a slightly creepy cult of personality about all of this." Rose confronted him on his use of this phrase, and he explained that it made him "a little uneasy that he's so singular. He's clearly managing his own spectacle. He knows how to do it. He's a -- I think, a deeply manipulative guy..." Later, all three marveled about how it was "amazing" that Obama "watches us watching him." Thomas and Meacham appeared during the second segment of Rose’s program on Wednesday night. The host first asked Thomas about how Obama seemed to be "always in charge of this campaign." After giving an anecdote about a meeting in which Obama discussed his vice presidential pick with his advisers, Thomas commented that Obama is very inclusive, yet very self-contained. It's an unusual leadership style." Rose then turned to Meacham and asked if it was known when he decided that he wanted to be president. Meacham first joked that it was just after the now president-elect had left eighth grade, and then continued in the same line of thought as his Newsweek colleague: "I think, to play off what Evan just said, he's -- he is very elusive -- Obama, which is fascinating for a man who has written two memoirs. He's the chief custodian of the story of Obama. He is a stand-alone brand." The three then had their exchange over Obama’s "creepy cult of personality:"
MEACHAM: They don’t let him out. And have you ever seen a victory speech where there was no one else on stage? No adoring wife, no cute kid -- he is the message. ROSE: ‘Slightly creepy cult of personality’? ROSE: What’s ‘slightly creepy’ about it? ROSE: How so is he ‘deeply manipulative’? THOMAS: I think he's always in control, you know -- he controls events, events don't control him. He's a pretty calm guy. He seem to be able to get people to do pretty much what he wants. I think the key moment, to answer your question -- when did he have this inking. I think it's when he was running for -- to be the president of the Harvard Law Review. He would spend a lot of time searching for himself, and deciding that he was a black man -- and he goes to Harvard and there's this politically-correct frought time, and there are conservatives and there are liberals. He manages to persuade all of them that he's on their side....And he realizes that people want to help him. They want to help him. It makes people feel good to help -- And this is an important insight for him. Oh my gosh, I have this gift. I have this knack. People are going to want to help -- want to help me. I'll let them help me, all the way to the White House. I'll bet you that was the first time. That's when he starts to write his memoir, and the memoir stops before he gets to Harvard....He leaves out the critical chapter, because I think the critical moment then is when he realizes he has got this gift, and he is going to ride it as far as he possibly can. Meacham then "slightly disagreed" with his colleague’s "slightly creepy" assessment, and compared Obama to FDR and Reagan. Rose replied to this by gushing over the president-elect’s charisma and ability to speak. The two Newsweek editors wholeheartedly agreed. MEACHAM: He writes in ‘Audacity of Hope’ -- and I think every presidential candidate should have to write memoirs because they are inadvertently revealing often, but he’s very explicit. He understands the character of Obama in this drama he's constructed. It's fascinating. He says, ‘I am a screen on which people project their visions, their hopes,’ and he could be a redemptive figure as long as race was implicit and not explicit. As long as he was as, you know, smart as he could be, work as hard as he could -- as Evan says, create a FDR-like circle around him with everyone trying to help him, he could be the center of attention, the star of this, and that's, I think -- and this is -- I slightly disagree. I don't think it's creepy. I think it's -- I think it's like Reagan. I think it's like great charismatic leaders who project brilliantly, but who are, in fact, in control -- very much in control behind the scenes. ROSE: Watching him last night -- that speech when he’s out there alone, and watching him in Denver, same thing -- when he's making a speech. He -- he knows the power of his ability to speak, and there is at the end, when he finishes it -- you know, with certain speakers, there's a kind -- they're overwhelmed by the enthusiasm of the moment. MEACHAM: He watches us watching him. MEACHAM: And, you know, you read about Bobby -- Bobby Kennedy fed off it, right? THOMAS: Oh, absolutely. I mean, it was a direct elemental contact. ROSE: And so does -- so does Bill Clinton. THOMAS: He is more closer to Jack [Kennedy]. Jack was the one who could stand back and watch himself being watched. What really is "creepy" is watching these three talk about Obama.